Join TODAY at the 2012 London Summer Olympics and keep up with the athletes, culture and conversation surrounding the sports. Read our live blog, updated daily. Pistorius sorry for timing of outburst at Paralympics -- but is brand 'destroyed'? 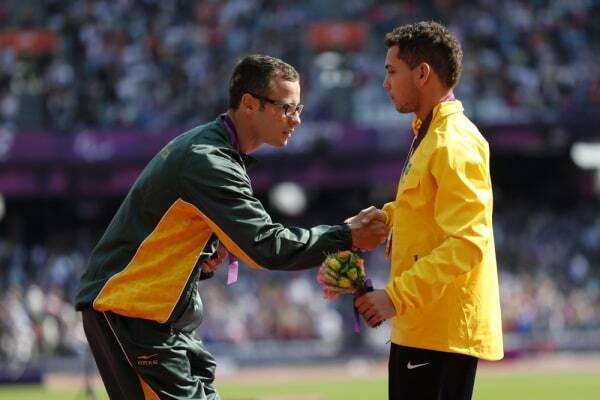 Oscar Pistorius of South Africa, left, and Alan Fonteles Cardoso Oliveira of Brazil shake hands on the podium after the Men's 200-meter final during the London 2012 Paralympic Games on Sunday. Pistorius apologized Monday for the timing of his complaints about a rival's blades following his defeat in the final, but insisted that officials need to change the rules to prevent some runners from getting an unfair advantage. Updated at 6:15 a.m. ET Tuesday: LONDON - “Blade Runner” Oscar Pistorius -- the unofficial face of the Paralympic Games -- was clearly still reeling Monday after losing a key race over the weekend. Pistorius issued an apology for “the timing” of his remarks, which in essence accused race winner Alan Fonteles Oliveira from Brazil of not playing fair. But the usually mild-mannered South African did not step back from his statement alleging that Sunday’s race was not run on an even playing field. On Tuesday, some in the British media speculated whether he had already tarnishing his image. "If Oscar had run the time he can run I don't think we'd be having the debate about the length of the blades or how tall an athlete should be on blades," Gareth A Davies of the Daily Telegraph said on the U.K.'s Channel 4 News. "I think his outburst kind of ruined in a sense, or destroyed the Pistorius brand," Davies said. "He's running faster backwards now than he runs forward, (isn't he) with his retractions," anchor Jonathan Edwards joked. The 200-meter final was the Paralympic race Pistorius had said he was looking forward to the most, and his shock at losing was palpable. Simply put, he was the one to beat. In Saturday’s qualifying heat, Pistorius had set a new world record. He’d won the gold in the 200 meter in Beijing. Doctor Gerry Versfeld, Oscar Pistorius' doctor, describes the decision to amputate the sprinter's legs when he was a boy. NBC Sports' Mary Carillo reports for Rock Center. But then came Sunday night’s race, and his stunning loss. “We are not running a fair race here. I can’t compete with Alan’s stride length,” said Pistorius, who made Olympic history this year as the first disabled athlete to run in the able-bodied games. 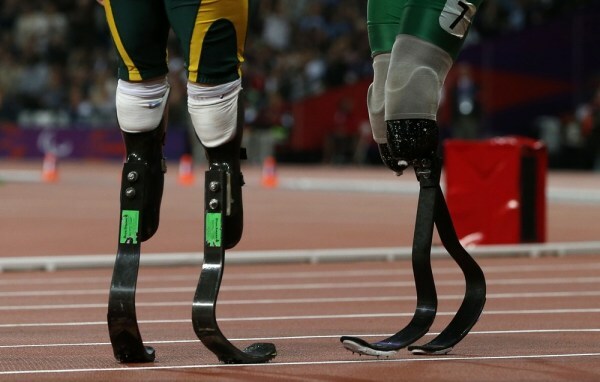 Pistorius himself fought claims that carbon-fiber prosthetics are advantageous when compared to human legs. In front of a sold-out stadium Sunday night, the 24-year-old South African had a clear lead coming around the final bend. Then Brazil’s Oliveira surged in the final stretch, passed Pistorius, and won the race by .07 seconds. "I don't know how you can come back, watching the replay, from eight meters behind on the 100 to win. It's absolutely ridiculous," Pistorius told British broadcaster Channel 4 in a trackside interview. South African runner Oscar Pistorius, who lost both his legs as a child, talks with TODAY's Savannah Guthrie about becoming the first double amputee to compete in the Olympics, and says it was "difficult" to hear people say his prosthetics give him an unfair advantage. Usually known for his modesty and good sportsmanship, Pistorius accused Oliveira of having an advantage by adjusting the length of his blades, thus giving the Brazilian a longer stride. "The [International Paralympic Committee] have their regulations. The regulations allow that athletes can make themselves unbelievably high. We've tried to address the issue with them in the weeks up to this and it's just been falling on deaf ears,” he said on Channel 4. Pistorius’ remarks reverberated through the sporting world. The blades of Brazil's Alan Oliveira (R) and South Africa's Oscar Pistorius are seen after the Men's 200m T44 classification at the Olympic Stadium during the London 2012 Paralympic Games on Sunday. Thomas did not hold out much hope that Olympic authorities would change their decision. “I don’t think they’re just going to suddenly tear up the rule book just because Oscar said something. Although he’s the king of the sport, rules are there and it probably takes a long process to get things looked at,” he said. Indeed, the International Paralympic Committee defended its rules by tweeting a photo showing the maximum heights allowed for individual athletes, and showing Pistorius at a height of 193.5cm and Oliveira at 185.4cm. “There are rules in place with IPC Athletics whereby we measure the length of the blade prior to competition, check they're in proportion with the body and all of the athletes last night passed the test, so yes, he (Oliveira) was a legitimate winner,” IPC representative Craig Spence said. Click here of The Science of Sport's findings on the race. On Monday, Pistorius stuck by the essence of his post-race comments and did not step back from his complaint. Meanwhile, Team South Africa and SASCOC (South African Sports Confederation and Olympic Committee) issued a statement welcoming Pistorius' apology. Oscar Pistorius from South Africa became the first double amputee to compete in the games by running Â the men's 400-meter race. He says that having the opportunity to represent his country in the Olympics "far surpassed" his expectations. "We note and welcome Oscar's apology for anything said in haste, and we obviously fully understand that he was emotionally upset immediately after such an important event here in London. We again congratulate Oscar on winning his silver medal on Sunday. As always we are fully supportive of all our athletes and will engage through the official channels from the National Paralympic Committee in South Africa to the International Paralympic Committee (IPC) on any concerns that Oscar may have." Oliveira, who called Pistorius a “great athlete,” said he was saddened by the South African’s reactions. Pistorius and Oliveira are on course to meet again in round one of the 100 meters on Wednesday and round one of the 400 meters on Friday. Assuming they both make those finals, they will race again at the 100 meter final on Thursday and the 400 meter final on Saturday. Hey, wasn't he the guy that said the blade size and type didn't matter when he wanted to run the regular Olympics? This is just poor sportsmanship.